Some gardeners like to soak the seed a few hours before planting to aid in germination. Make successive sowing up to mid-July for full sized roots for winter storage. Plant Radish seeds in the row with Carrots. The Radishes will sprout quickly to mark the row, They will mature and can be harvested before the Carrots get too large. 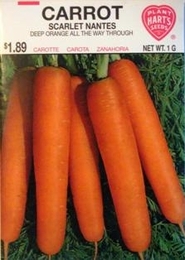 Bulk Carrot Scarlet Nantes seed available. 3lbs of Carrot seed needed per acre. Average Carrot yield per acre - 494 bushels cut, 800 bushels bunched.